René Girard (1923-2015), philosopher, social scientist, literary critic, theological thinker, analyst of anthropology and culture—not to mention provocateur, sage, rebel and wit—many labels might be given to Girard, one of the 20th century’s most significant theorists whose work spanned decades, continents and disciplines. He was Professor Emeritus of French Language, Literature, and Civilization at Stanford University. He was inducted into the prestigous Académie Française in 2005 as one of their forty immortels. Michel Serres, receiving Girard into the academy, described him as ‘the new Darwin of the human sciences’. 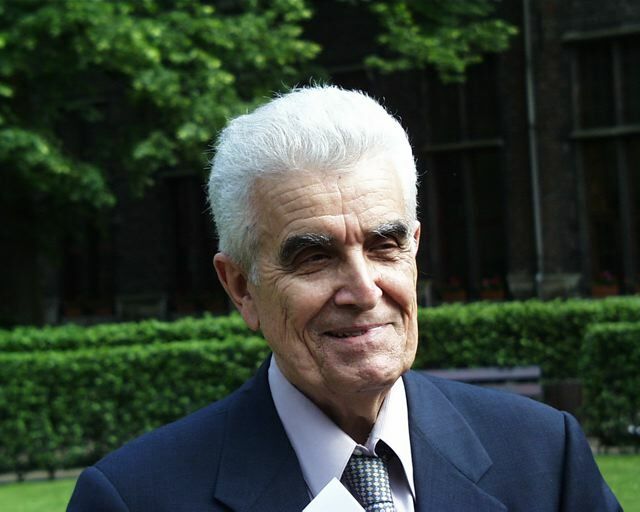 René Girard was born in Avignon on December 25, 1923. He studied at the École des Chartes, Paris, before moving to Indiana University where his PhD in History was conferred in 1950. Subsequently holding positions at Duke University, Bryn Mawr College, and Johns Hopkins University, Girard published his first book: Mensonge Romantique et Vérité Romanesque (Deceit, Desire and the Novel) in 1966. In it he argued that ‘great novelists’ such as Cervantes, Proust, Flaubert and Dostoevsky understood that desire is mimetic (that is, stimulated by and dependent on others). In his later work, Girard demonstrated the origins of violence in competing mimetic desires. He also showed the origins of culture in the scapegoat-mechanism, in which an innocent victim is sacrificed to catharsise the community of violence. Religion, according to Girard, originated in these sacrificial mechanisms, but developed in the Judeo-Christian tradition into a denouncing of violence and the scapegoat-mechanism. While holding positions at the State University of New York at Buffalo and Johns Hopkins University, Girard published the two books in which he developed his mimetic theory from a theory of desire to a broader conception of human culture, the nature of violence, and the notion of the sacred: La Violence et le sacré (1972; Violence and the Sacred, 1977) and Des choses cachées depuis la fondation du monde (1978; Things Hidden Since the Foundation of the World, 1987). In 1981 he became Andrew B. Hammond Professor of French Language, Literature, and Civilization at Stanford University, where he remained until his retirement in 1995. During this period he continued to publish, eventually producing nearly thirty books including Le Bouc Émissaire (1982, The Scapegoat, 1986), A Theatre of Envy: William Shakespeare (1991), and Je Vois Satan Tomber Comme L’éclair (1999, I See Satan Fall Like Lightning, 2001). Recently, Girard’s last major book was published: Achever Clausewitz (2007, Battling to the End, 2009), in which he engaged with the ideas of Carl von Clausewitz, the Prussian military theoretician who wrote On War, to argue that human history is accelerating towards extremes in warfare and ‘apocalyptic’ violence. This book, according to a Stanford peer, ‘created the kind of firestorm only a public intellectual in France can ignite’, placing Girard as a provocative contributor to 21st-century public debate. Girard was a fellow of the American Academy of Arts and Sciences and twice a Guggenheim Fellow, as well as the recipient of many other honours, including a lifetime achievement award with the Modern Language Association. When Rene Girard died at his Stanford home on Nov. 4, 2015, at the age of 91 COV&R lost its Honorary Chair and one of the greatest thinkers of the 20th and 21st century. Below is a selection of the tributes that flooded the international press to commemorate his legacy. Haven, Cynthia, “Stanford professor and eminent French theorist René Girard, member of the Académie Française, dies at 91″, in Stanford News, November 4, 2015. Cowdell, Scott, “The ‘Darwin of the Human Sciences’: Rene Girard, a Theological Retrospective, in ABC (Australia), November 5, 2015. Reineke, Martha J. “Does Violence Always Win? : Learning From René Girard (1923-2015).” In Religion Dispatches, November 30, 2015. Hardy, Quentin, “René Girard, French Theorist of the Social Sciences, Dies at 91”, in Ney York Times, November 11, 2015, p. A31. Anon., “René Girard, philosopher – obituary”, in The Telegraph, November 9, 2015. Birnbaum, Jean, “Mort de René Girard, anthropologue et théoricien de la «violence mimétique»”, in Le Monde, November 5, 2015. Lapaque, Sebastien, “Mort de l’académicien René Girard”, In Le Figaro, November 5, 2015. Maggiori, Robert, “Nécrologie: René Girard, dernier désir”, in Liberation, November 5, 2015. Altwegg, Jürg, “Wir sind selbst die anderen”, in Frankfurter Allgemeine Zeitung, November 6, 2015, p. 9. Thomä, Dieter, “Im Menschheitskeller. Zum Tod des Kulturanthropologen René Girard”, in Neue Zürcher Zeitung, November 6, 2015, p. 42. Assheuer, Thomas, “Wenn der Teufel vom Himmel fällt. Nachahmung, Rivalität, Gewalt: Zum Tod des großen Kulturanthropologen René Girard”, in Die Zeit, November 12, 2015, p. 60. Niewiadomski, Józef, “Wir brauchen keinen Sündenbock”, in Die Furche, November 12, 2015, p. 46.